The three things that most attract visitors to Fort Scott—guns, horses and guns— will be featured on Labor Day Weekend this year at Fort Scott National Historic Site. A program demonstrating the small arms of both the infantry and the dragoons soldiers will be offered on Saturday and Sunday this weekend, while the site’s artillery crew will fire the big gun on Sunday and Monday. Additionally on Saturday, reenactors portraying dragoon soldiers will be on horseback and offering mounted demonstrations. 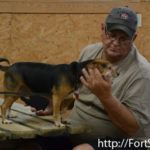 Other programs that weekend will honor the work of the soldiers or things the soldiers did to take a break from work. On Saturday, September 3, the bakehouse and mess hall will be active with the smells of soldiers cooking bread and the noon meal. An 1840s doctor will have his shingle out at the post hospital. A laundress will be demonstrating Dutch oven cooking and a soldier will be showcasing 1840s construction methods and tools. 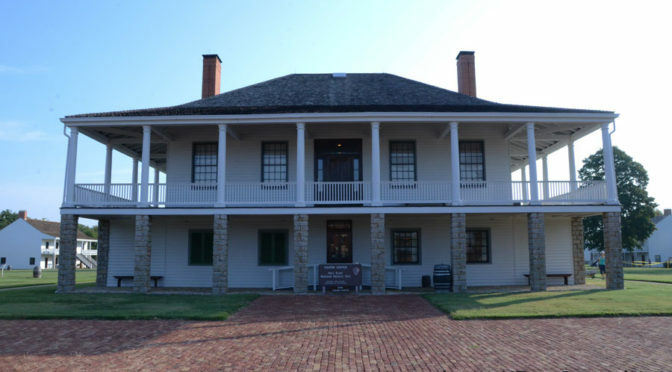 On Sunday and Monday, you can catch up on the latest gossip at the fort in a program titled “Frontier Gossip,” which will focus on officers’ wives at Fort Scott. “Bucket Brigade” will be a relay showing how the guards fought fires. 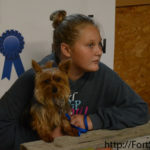 Kids of all ages are invited to participate in this program and should be prepared to get wet. 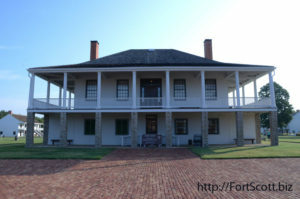 On Monday, there will also be a special Labor Day tour “From the Crack Post of the Frontier:” This tour will focus on the labor force, building materials, architectural styles and construction techniques used in the building of Fort Scott. In addition to these programs, there will be a Centennial Grand Ball on Saturday, September 3rd, at the historic Memorial Hall. 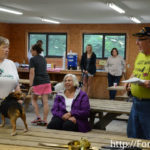 It is being hosted by the volunteers and Friends of Fort Scott National Historic Site in commemoration of the 100th Anniversary of the National Park Service. Doors open at 6 p.m. with dancing from 7 to 10:30 p.m.
 General Public- $15 in advance/$20 at the door per person, or two for $25 in advance/$35 at the door.  Friends members- $10 in advance/$15 at the door.  Children 12 and under and Dance Observers- $5. 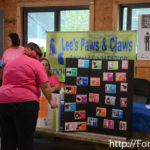 All proceeds go to the “Friends” group, which will use the funds to support special programs at the historic site. 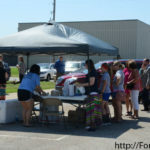 Tickets can be purchased at Country Cupboard or the Fort Scott Chamber of Commerce. A rehearsal for the ball will be held that Saturday from 10 a.m. to 1 p.m. in the historic site’s Grand Hall. Following is the schedule of activities for the weekend. 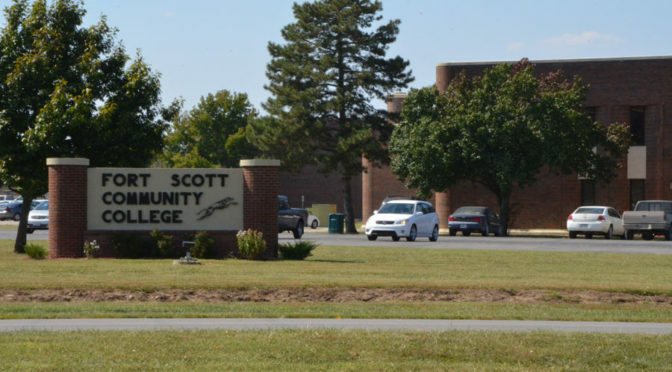 With the first day of fall classes rapidly approaching, Fort Scott Community College can again boast in the fact that it is ranked in the top five community colleges in the nation according to a study by SmartAsset. For a third year, the New York based company looked at the community colleges in the nation and ranked them according to their in-state tuition, student-faculty ratio, the graduation and transfer rate and the ratio of the students’ starting salaries upon entering the work force compared to their tuition fees. Out of the 565 two-year colleges considered, FSCC was ranked fifth, dropping from its position at number one in 2015 only because of a slight decrease in their graduation and transfer rate, which SmartAsset revealed had been evident in many of the colleges in their most recent study. The study showed that FSCC has a student-professor ratio of 14-1, more ideal than the national average of 20-1. The starting salary for students is 1.05 times the tuition they paid and the graduation and transfer rate is 51 percent, higher than the 40 percent national average but slightly lower than previous years. 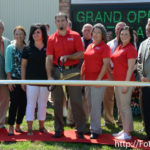 “Continuous improvement is what we’re striving for,” Johnston said, adding the study is evidence of those efforts made by the staff at FSCC. SmartAsset’s vice president of content, AJ Smith, oversaw the research for the study which has placed FSCC as one of the top two-year colleges each of the three years the study was released. 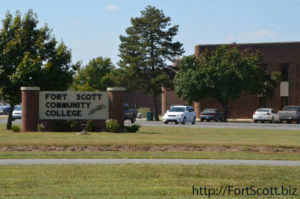 “Compared to the national averages, Fort Scott does very well,” Smith said. Neosho County Community College was ranked ninth in the nation after being considered #45 on the list in the previous year’s study results. 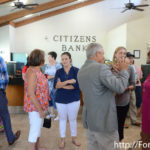 The Fort Scott branch of Citizens Bank celebrated their arrival with a grand opening event Wednesday, providing food and drawings as well as the opportunity to view the location on Highway 69. 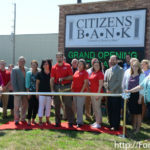 The fifth branch of Security Bank out of Rich Hill opened its doors in Fort Scott at the end of May, providing another option for members of the community looking for loans or other assistance with finances. 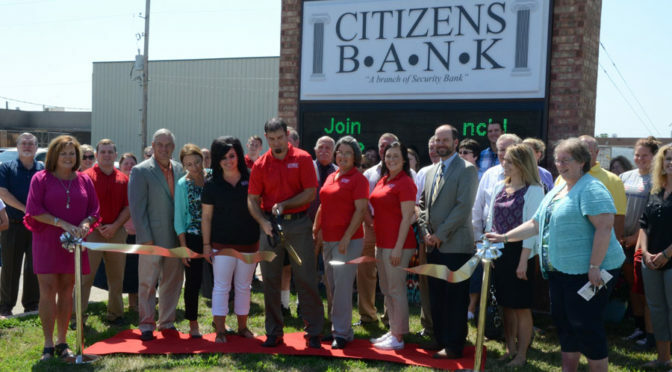 “We’re pretty versatile,” bank president Cliff Yarick said of their services, expressing their excitement to be in Fort Scott. 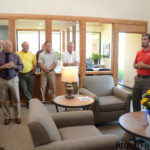 Bank owner Randy Shannon said they are glad to bring a branch of their bank to Fort Scott, a larger community that is still rural and agriculture-based, after opening other branches in smaller communities such as Hume and Rich Hill. 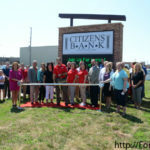 “We’re just glad to be here,” Shannon said, saying they look forward to serving the banking needs of the community. 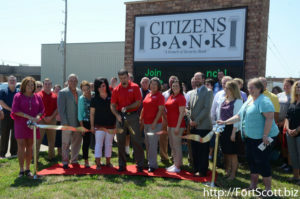 Lindsay Madison, executive director of the Fort Scott Area Chamber of Commerce, said she is glad to see an empty building being put to use once again in Fort Scott. 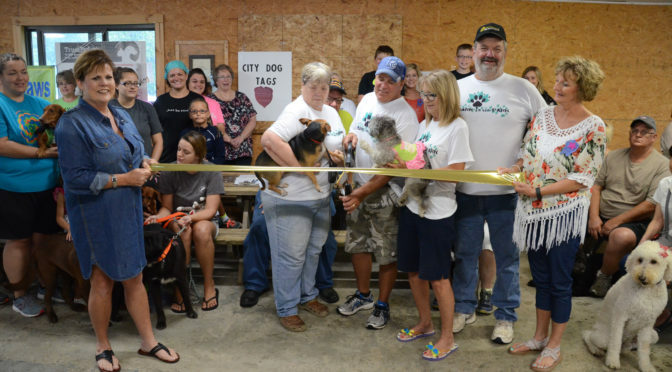 Despite the wet weather, numerous dogs and their owners attended the ribbon-cutting ceremony Saturday morning for the new Bark in the Park dog run located at Gunn Park near Shelter House #7. 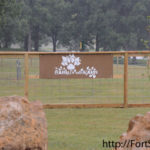 The idea for the dog park began when community members Jim and Martha Scott saw such a park a few years ago when traveling through another city. 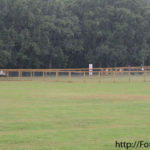 Since that time, the city of Fort Scott, the Fort Scott Area Chamber of Commerce and several other individual businesses and persons assisted in making the park a reality. 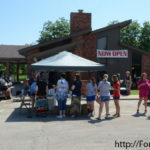 Some of the donations included dog toys, park benches, waste bags, a sign as well as money for the fencing materials and time volunteered to dig the postholes from businesses such as Sleep Inn and Suites and Walmart as well as a collection of individuals. 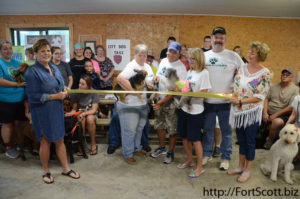 Lindsay Madison, executive director of the Chamber of Commerce, expressed their excitement for the new dog park and encouraged others to approach the chamber with similar ideas for the city of Fort Scott.